Our Customer's Own Material (COM) option allows you to supply your own fabric to make your custom product. 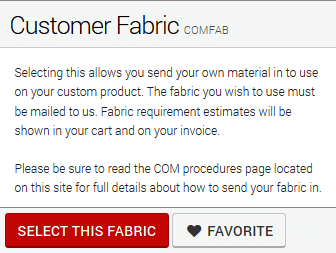 At the fabric selection step, select the COMFAB option located in the Fabric Gallery. Select "Choose a different fabric" on the product builder to open the Fabric Gallery. Choose Customer Fabric (COMFAB), which is usually shown as the first fabric in the Gallery. Once on the COMFAB details page, click "Select this Fabric." Depending on the device or screen size you are using, the screenshots above may not match exactly. However, the process will be identical. Determine the amount of fabric you will need. Consider the repeat, cording, and stripe patterns when determining the yardage requirements. When you place an order, fabric requirement estimates are shown in your cart and on your invoice. Requested linear yardage is based on a 54" roll width (ie, one linear yard = 54 × 36). Please only use this estimate as a guide for determining how much fabric to send. For striped COM fabric, please include an additional 15% of fabric and indicate which direction the stripe should run (vertically or horizontally). For reversible COM fabric, please indicate which side should be visible on your finished product. If you are using a different COM fabric for the welting (also known as cording or piping), clearly indicate which fabric will be used for the piping. Cut fabric and fabric rolls are accepted. Important: Please ATTACH a copy of your invoice to your fabric. If you cannot send a copy of your invoice, please ATTACH the following information to the fabric: your name, invoice number, shipping address, phone number, and e-mail address. How do I find out how much fabric to send? After you place an order, a fabric requirement estimate will be shown on your invoice. Please note, this is just an estimate; if your fabric has a large repeat, a stripe pattern, or a welting/piping requirement, please plan on sending more fabric than the estimate — we recommend an additional 15%. If the COM quantity received is inadequate to complete the order, the order will be placed on hold, and you will be contacted by a customer service representative. Production will not begin until we receive adequate fabric to complete the order. Any leftover fabric will be discarded. How much does it cost to use my own fabric? There is a one-time (per order), non-refundable $25 charge for the handling of your material. We do not discount our cushion price for COM. Your cushions will be priced at our zero markup fabric cost. Once we receive your fabric, your custom order will usually take 15-20 business days for completion. Once shipped, ground shipping can take up to five business days for delivery, depending on your location. Since we are usually shipping from the east, a California cushion order may spend a full five business days in transit. How should I ship my fabric? You will need to send COM via a shipping service that provides a tracking # and proof of delivery. You will be responsible for your fabric until it is in our possession as evidenced by a signed tracking document. COM fabrics must be readily available in the market place at competitive prices in the event Highland Taylor needs to replace the fabric due to loss or damage. We reserve the right to decline fabrics that we deem to be difficult or problematic. For example, we do not sew texelene or sheers. Highland Taylor liability for lost, misplaced, or damaged fabrics will not exceed $50 per yard. Proof of purchase with pricing may be required.